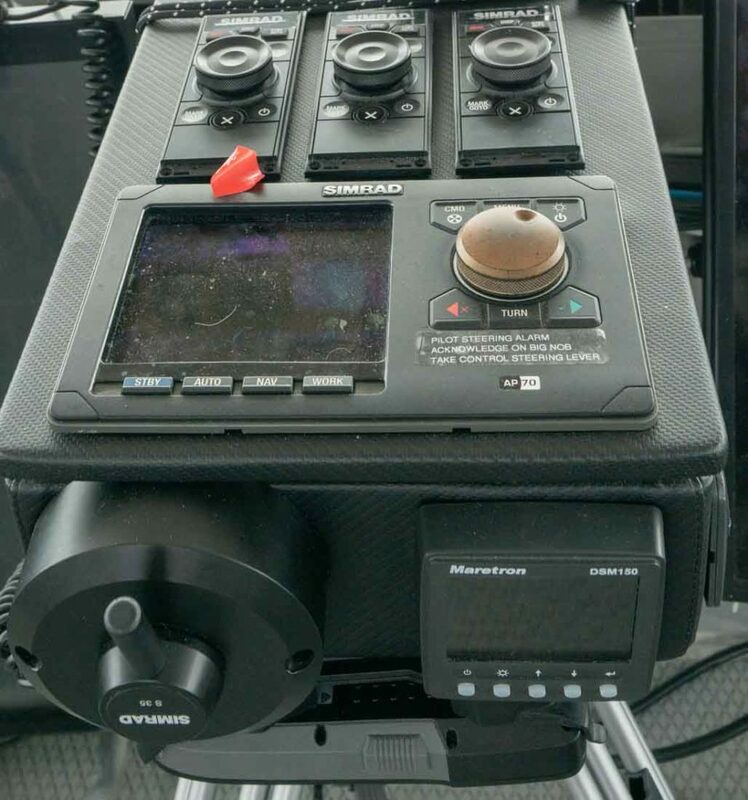 This dim photo, taken with available light, turns everything we thought about navigation gear layout on its head. We are in the process of revising the Matrix Deck helm on Cochise, throwing out every design approach we have employed over the past 40 years in the process. There is a large stack of tried and tossed prototypes in Cory and Angela McMahon’s Triton Marine shop. Each step has led us down a new road of discovery. Normally we would have waited until we had a completed project to show you what we have been doing. But if any SetSail visitors are working on navigation system layouts now, we want you to be aware of this. This project started as a way to reduce screen and instrument glare on windows, thereby improving our night vision. This was easily achieved by dropping the monitors well below their usual desk top position. Having tried several dozen combinations, we can tell you that the monitor tops at roughly 28″ to 31″ above the deck works well. More on this later. From the photo above you can see that there is no discernible window reflection. 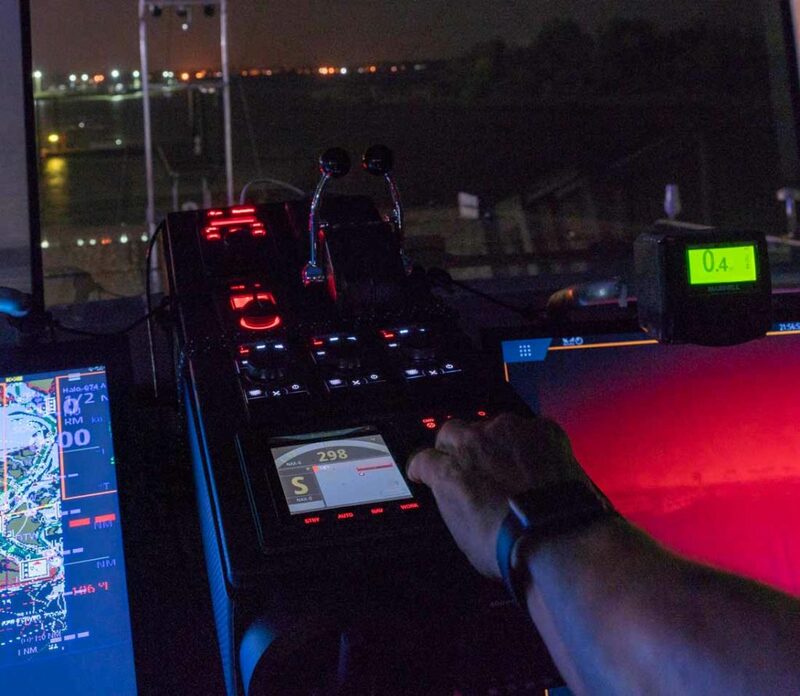 When we began this quest we assumed we’d always be standing while keeping watch in traffic or in navigational scenarios requiring quick action. After all, we’ve been doing this a long time, and like most mariners, standing up was part of the drill. We never asked ourselves why. Then, after hours of 3D modeling, prototypes and revisions numbering in the high 40s, an epiphany. If we had good sight lines–now possible with the lowered monitors–and we could comfortably reach the required controls while seated, standing was no longer a necessity. It became an option. We have been standing all these years because we had to, in order to have a good view and in order to touch all critical controls instantly. Since we were standing, we could spread things out, nav desks were larger, etc. A self-perpetuating cycle . The first time we sat at the revised controls with Cochise underway, this all instantly came into focus. The “aha” moment. …And in daylight. We are moving a few thing around to gain even better operational efficiency, and then we are done. There are now four monitors in the equation. 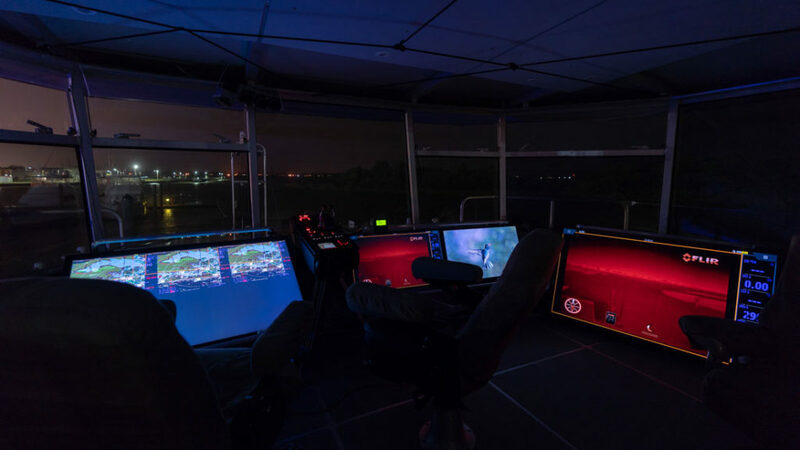 A 49″ touch screen to port, a pair of 32″ monitors center, and a 55″ mounted on a swing arm to starboard (the other monitors rotate on a transverse axis). We will have more to say on many of the details when we have this set up completed. Lower the monitors to below desk or coaming height, where they can be viewed nearly vertical. 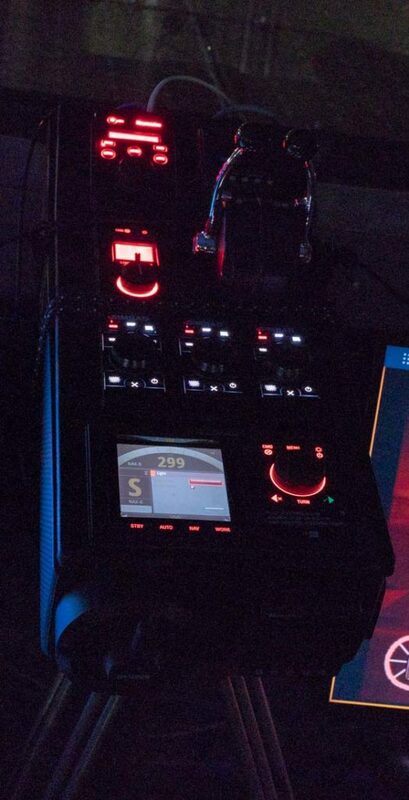 Cluster controls and instruments where they can be easily reached while seated. Keep sight lines forward clear of monitors and instruments. This entry was posted on Friday, April 27th, 2018 at 1:50 pm and is filed under Dashew Logs, FPB 78, The Logs. Both comments and pings are currently closed. Remarkable. There’s nothing like exploring possibilities to effect a true transformation in night-time navigating — when it’s you doing the exploring, huh, Steve. I so very much appreciate where you think and craft from. You’re one the few men i truly admire and have respect for. Thank you for posting this interim-update, i was wondering how you were coming-along with this project. You’re so accurate that this would be extremely-useful and cost-effective to have these generating-principles for those who are in the process of structuring their nav-setup. Thank you so much for continuing to share your experiences in refining your ultimate cruising boat. You may remember I paddled out in my kayak with my dog when you had Cochise anchored out off Vuda Point Marina, and we chatted about our common friends, the days of cruising back in the 1970’s, and the fact that we were having a long, lean aluminum powerboat designed by Artnautica in New Zealand. I recently wrote a blog post about that meeting and your characteristic generosity in sharing your time and knowledge with others. What I love most about this post is your description of that epiphany moment when you realized you could change something you’d been doing ever since you began cruising. It is your willingness to look at everything and to throw out old assumptions that has made you the innovator and inspirational teacher that you are. While my husband Wayne and I were saddened to see the FPB line come to an end, we hope you will appreciate the tremendous influence you have had and will continue to have on yacht design. 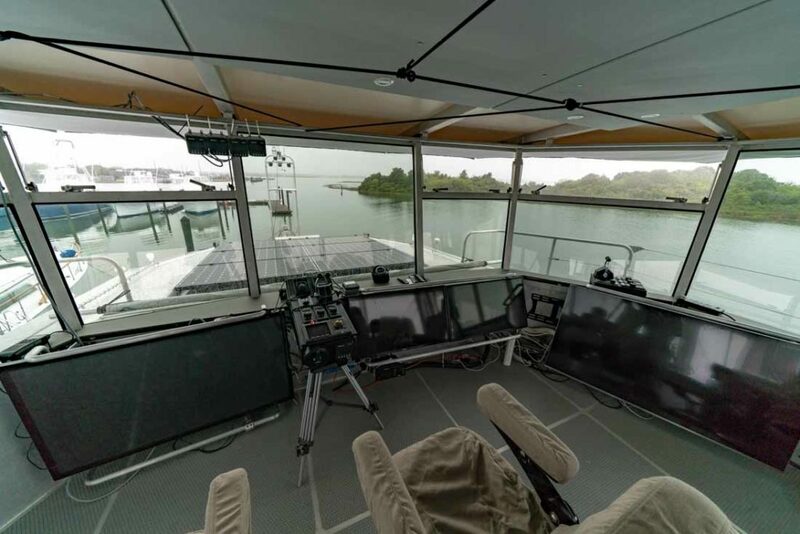 We are off applying as much as we can of what we’ve learned from you by working with our designer and builder to create our own ultimate cruising boat. We will never claim an affiliation, but we will always give credit and be grateful for your inspiration.